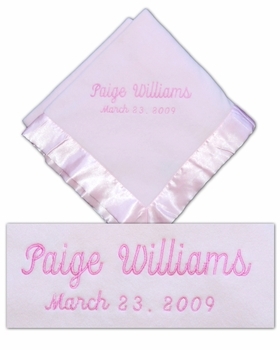 Trimmed with satin and made with soft micro fleece shaded in pink, the personalized and embroidered baby blanket comes with a deluxe matching satin binding and has an ultra-soft finish. This high quality blanket is embroidered with baby's name and birth date for a stunning personalized baby gift to remember! The blanket measures a large 36 by 50inches. Just beautiful and ships for free too! Not only is the quality perfect but the selection and the price are top notch! Your products are wonderful! We get nothing but compliments! Processing Time 5 business days. Does not include shipping time.